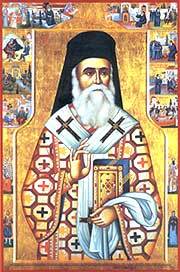 St. Nektarios of Aegina: Miracles are not impossible from a logical standpoint . . . This entry was posted in St. Nektarios of Aegina and tagged Logic/Logical Mind & Thinking, Love of God, Miracles, Natural Laws on November 22, 2013 by . St. Nektarios: After the end of the General Judgment . . . This entry was posted in Sayings from Saints, Elders, and Fathers, St. Nektarios of Aegina and tagged Eternity, Final Judgement, God as Judge, Hell, Partial Judgement, Righteous, Sinner, The Evil One on November 21, 2013 by . St. Nektarios: Christian religion is not a certain philosophic system . . . This entry was posted in Sayings from Saints, Elders, and Fathers, St. Nektarios of Aegina and tagged Academics, Faith, Holy Tradition, Opinion, Philosophy on November 19, 2013 by . St. Nectarios of Aegina: We have within us deeply rooted weaknesses, passions, and defects. . . . This entry was posted in Sayings from Saints, Elders, and Fathers, St. Nektarios of Aegina and tagged Falling Down Getting Up, Passions, Patience, Prayer, Spiritual Healing, Spiritual Illness, Theosis, Transforming into a Saint on July 25, 2013 by . This entry was posted in Sayings from Saints, Elders, and Fathers, St. Nektarios of Aegina and tagged Happiness, Pure in Heart on July 12, 2013 by . St. Nektarios: Do not think that you have a right . . . This entry was posted in Sayings from Saints, Elders, and Fathers, St. Nektarios of Aegina and tagged Complaining, Omniscience of God, Petitioning God, Prayer on July 10, 2013 by .